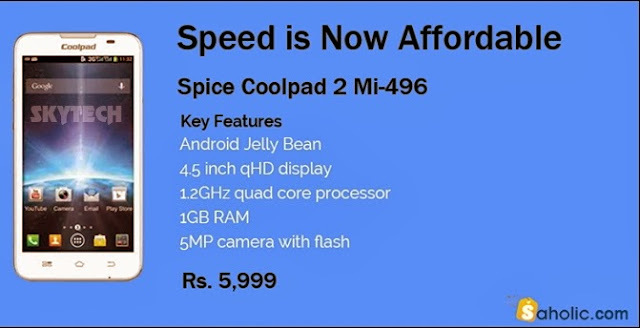 Spice mobiles launched the Coolpad 2 Mi-496 back in June this year. It is an Android Jelly Bean running device with 4.5 inch qHD display. The phone is powered with 1.2GHz quad core processor and 1GB RAM. It has 5MP autofocus camera with flash for capturing images and shooting videos. For connectivity, it has GPRS, Bluetooth, 3G, Wi-Fi, and USB. Other features are A-GPS, 4GB. ROM, 1700 mAh battery, FM radio, music player, and 32GB expandable memory. Pretty much every thing is covered in this phone. Spice Coolpad 2 was initially priced at Rs. 11,990 now it has got a seriously huge price drop and its available for Rs. 5999 and that’s almost 50% off on the price. And now that’s what we call a “Real Deal”. It will be a great device if you are looking for a budget smartphone and want good android experience. Spice Coolpad 2 Mi-496 is now available at Rs. 5,999 from online retailer Sahoic which is a official Spice mobile seller and its a Spice venture.